Europe and the USA—the birthplace of the MBA—have long been the dominant business education markets. But the dynamic is shifting—Asia Pacific is now the world’s fastest growing market for business master’s degrees. The Graduate Management Admission Council (GMAC) reports that applications surged by nearly 9% in 2018, compared with 3.2% growth in Europe, and a 6.6% fall in applications to US courses. There is further evidence of Asian excellence. When the Financial Times released its ranking of the best MBA programs in 1999, no Asian schools made the grade. Today, there are 16 featured schools, with INSEAD of Singapore and France, and Shanghai’s China Europe International Business School (CEIBS) in the top-10. Chinese and Southeast Asian schools largely lead the way, with Beijing, Shanghai, Hong Kong, and Singapore rising rapidly to prominence among prospective business school students, says Andrew Crisp, co-founder of Carrington Crisp, an education marketing consultancy that surveys prospective students on their study destinations each year. “There are some world class universities there, teaching programs in English, and the cost of study is a fraction of what it is in the US and UK,” he says. He notes that all these territories have economies that are generally growing strongly, sometimes spectacularly, which translates into great job opportunities as companies grow—think of Tencent or Alibaba in China. Rising salaries, he adds, often come with that growth. Indeed, this shift eastward of business education mirrors how the global economy is moving. China alone is the world’s second-largest economy, growing at a brisk clip of around 6.5% year-on-year. Southeast Asia’s rising populations and disposable income have also increased demand for business master’s degrees, with its business schools relying largely on domestic candidates to fill their classrooms. There are exceptions though, especially when you look towards the MBA. Asian countries seem to be far more attractive for international MBA candidates. Take, for example, Tess Wartanian, an Austrian who moved to Singapore to do an MBA at NUS Business School. “Singapore is a hub for international professionals and provides a lot of great career opportunities with multinational companies headquartered in the region,” she says. 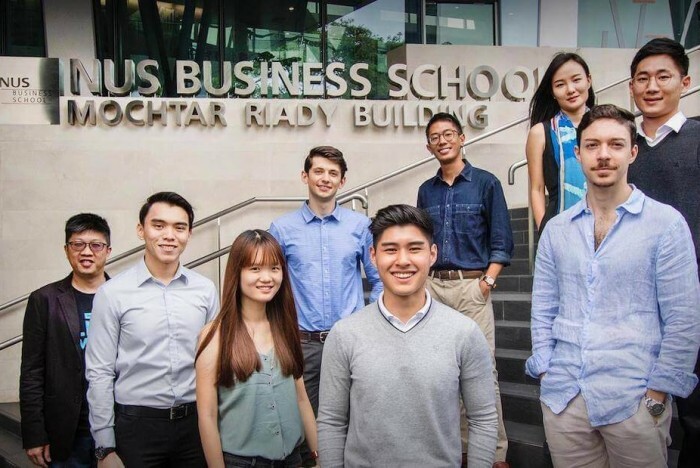 NUS receives about 1,500 applications each year and enrols 120 students on its MBA. The current cohort is comprised of 88% internationals. The Chinese and Southeast Asian business schools have themselves strived to improve the quality of their education, with Nitin Pangarkar, academic director of the MBA at NUS, noting a drive to attract top faculty and to raise their profiles globally. At CEIBS, for instance, nearly 94% of the most recent MBA cohort received job offers, according to the 2018 employment report, and with a 95% average salary increase to boot. It is a similar story at CUHK Business School in Hong Kong, which boasts a 98% employment rate, with 88% of the MBA students securing an offer to work in Asia. For Nitin, attracting more international students is a strategic priority. “We have an outreach activity in the form of attending fairs, conducting briefings, and interviews [with international MBA candidates]. We also benefit from word of mouth. In addition, we do selective digital and print marketing,” he says. Further south, Malaysia is another up-and-coming destination for international MBA candidates. The Asia School of Business (ASB), a startup school in Kuala Lumpur, is a partnership between MIT of the US and the Central Bank of Malaysia. In two years, it has grown to have two cohorts of full-time MBA students. Sean O Ferguson, director of ASB’s MBA program and the previous associate dean of HKUST Business School in Hong Kong, says that Malaysia is a great springboard for international candidates to build a career in Asia. While US and European schools still dominate most MBA rankings, China and Southeast Asia have become more competitive due to the political turbulence in the US and the UK, though the latter has been buoyed by the Brexit-induced slide in the pound’s value. Data and surveys show that at least some international students are put off the US, and some may well be turning to Chinese and Southeast Asian schools instead, given the increase in applications cited by GMAC. But one problem for some Chinese and Southeast Asian schools is a lack of diversity. Across Asia Pacific, 60% of business master’s students are domestic, says GMAC. And some lack international accreditation, though they often tend to be more gender-diverse than the rest of the world. These schools also face ever stiffer competition from corporate education providers, such as Alibaba’s Global Leadership Academy. Nitin at NUS counters that. “There are plenty of opportunities for many different types of players,” he says.